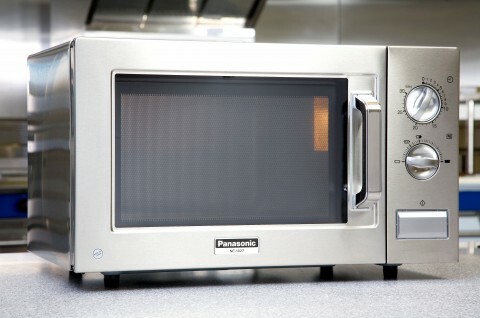 The Panasonic NE-1027 Light Duty 1000w Manual Dial Control Commercial Microwave is powerful, effective and easy to use; making it perfect for use in busy kitchens. This microwave features fully variable power levels, from 100 – 1000W, providing additional versatility; while dial controls for both the power level and timer ensure that operation is as easy as possible. While the NE-1027 Panasonic microwave is able to handle large tasks thanks to its 22 litre oven capacity (that’s 0.778 cubic feet! ), its stainless steel cavity and cabinet make it exceptionally easy to clean and maintain. This versatile and easy to use microwave is available for free next day delivery; please contact us for more details.